I have build 3 application that work with the binary.com websocket. Can place traids from MT4, it will then subscribe to the order to get the correct barrier and the outcome (win or lose alert). The WebSocket Client can be used to write a custom api message in mql4. Is a account to account trade copier, works with simple higher or lower options (will ignore barriar offsets). I use the write file funktin in mql4 to get signals from different indicators and the File Signal Filter to detect these files. The File Signal Filter will delete the file and activcate the strategy trigger for the defined timeframe. When all defined strategy triggers are active it will send a buy oder. ATA copier works for copy trades from where? Or who? What is the goal of that? On filter application, what is the content of sample text files? the goal is to copy traids from another traider but with individual money managment. the sample text files are empty, it just looks for the filenames (will deleete the files without reading the content). 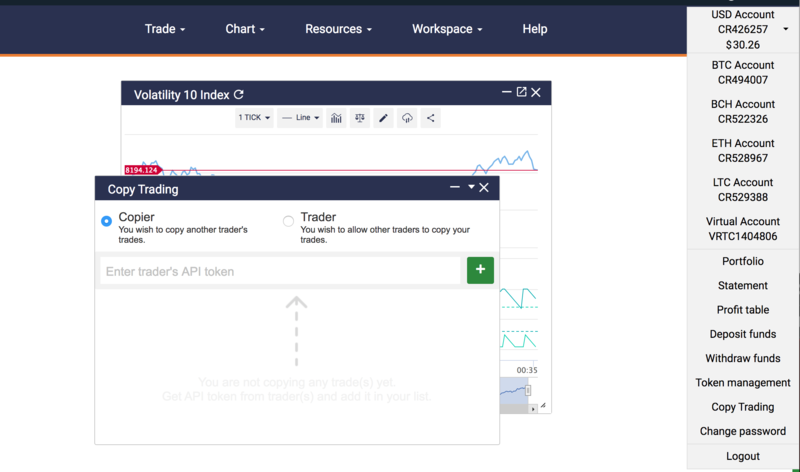 Have you tried Binary's Trade Copier? Here is a screenshot.